… where we woke up to somewhat better weather than what we went to bed with the night before. We received word shortly after 9am that the ferry from Andenes had once again left port, expecting to arrive in Gryllefjord around 11am. With a good hour to kill, I went for a bit of rock climbing near the hotel to snap a few pictures of the fjord and the wind-surfing gulls. Once in Gryllefjord, the waters looked acceptably calm and the ferry big enough for a safe crossing. Indeed, the first fifteen minutes were as smooth as can be, but as we left the protective land behind us, the waves got bigger and meaner. This was okay as long as they came from straight ahead, so the ferry was only going up and down, but before long the waves were going in every direction, and so was the ferry. In seamen’s terms, this is pitching, rolling and yawing; in my terms, this is unpleasant, uncomfortable and disagreeable. I was very glad when we docked in Andenes without having lost my breakfast. The whale safari, planned for the afternoon, got cancelled. As understandable as that was given the conditions at sea, it was another disappointment for the group. Andenes has little to offer for entertainment on a rainy afternoon, and believe me, I looked for it. I walked along the beach for half an hour, trying to appreciate the mountains on one side and a smattering of little island on the other, but the thick clouds and the persistent drizzle kept getting in the way. The day’s saving moment came at night. Our Norwegian neighbour in Bleik, where we stayed the night in three houses, had been so successful at fishing that day that he offered us a cod. After this lovely late-night snack, we finished the day with drinks in the local pub. The Bergs Fjord near Hamn on the island of Senja. A gull hovering in the wind at Hamn. The cod we received from our Norwegian neighbour in Bleik. Another travel day. The scenery of fjords under cloudy skies was by now familiar to us, so we spent most of the bus ride to Narvik playing cards. With the driver keeping a good pace down the curvy Norwegian coastal roads, this offered several challenges one doesn’t encounter when playing cards at home. We arrived in Narvik as thoroughly shaken as our pack of cards. Narvik is the northernmost city in Norway with a railway connection to the rest of the country. Dating back to the early 1900s, the railway was originally built to transport iron ore from the mines at Kiruna (see Day 12) to the port of Narvik. It’s still mainly used for ore transport today, but also sees passenger traffic by way of an overnight train between Narvik and the Swedish capital of Stockholm. We took this train from Narvik to Abisko National Park in Sweden. 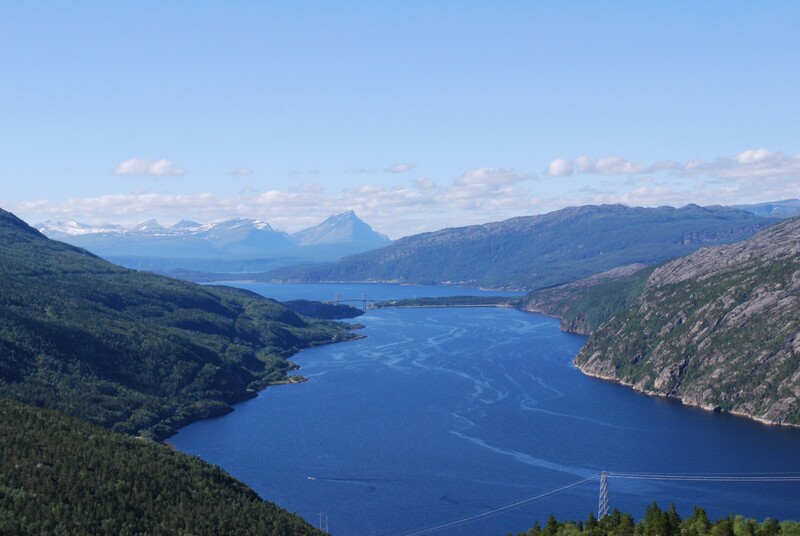 It was a spectacular ride with breathtaking views down the Rombaken Fjord as we wound our way up into the mountains spanning the Norwegian-Swedish border. Abisko National Park spans an area of 77 square kilometers on the southern shore of Lake Torne, the seventh largest lake in Sweden. The beauty of the lake, the Abisko River and the surrounding mountains were a welcome sight after the bleakness of Bleik. The sunshine and a temperature of 20 degrees centigrade were also much appreciated. Not wanting to waste any of that, we went for a quick hike at the Abisko gorge. At night, we enjoyed our first sunset in ten days. Mind you, that wasn’t simply the first time we saw the sun go down. It was the first time it went down at all since the last night at home before the holiday started. The Arctic is a special place indeed. A bright red railway station. View from the train: the western end of Lake Torne. 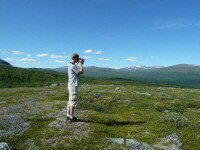 Abisko National Park is an excellent place for hiking. 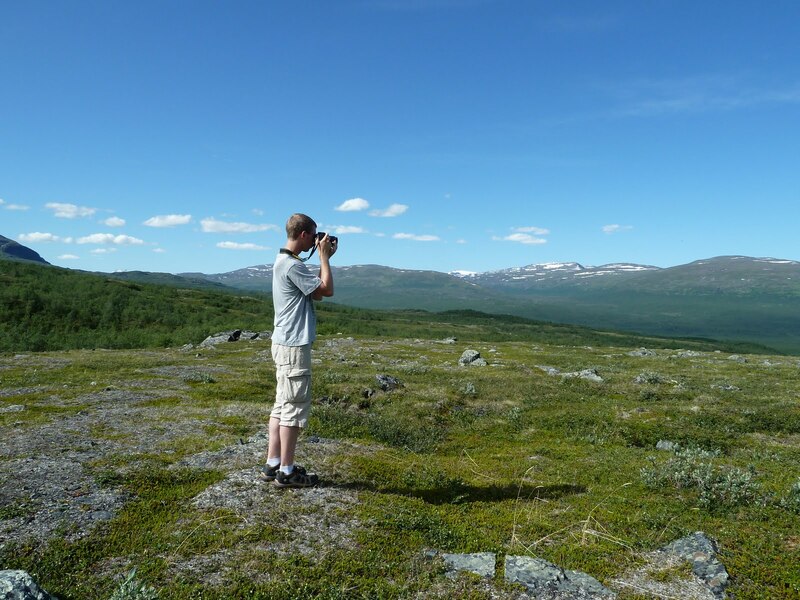 It is the starting point of the Kungsleden, a 440 km trail through Sweden’s arctic wilderness, and there are plenty of other named and unnamed trails. Five of us set out on a roundtrip of about 18 km, first following the Kungsleden along the Abisko River, then following a side river east, and finally looping back to the hotel. The picture below, of the Abisko valley, shows the approximate route. The hotel is in the bottom left and the Abisko River runs from right to left; we walked in a counter-clockwise direction. The various trails are rather poorly marked—except for the Kungsleden—so half of the time we weren’t sure we were going the right way, but we nonetheless managed to follow the route we wanted to. (Reading out my GPS logger at home confirmed this.) The first part, down the Kungsleden, was easy going and a good warm-up for the more challenging part along the side river. There, the trail was often no more than a foot wide and sometimes disappeared altogether when the ground turned rocky. There was a direction marker at the point where we had to turn left and head back to the hotel, but it stood a hundred meters down that new trail instead of at the intersection of the two trails. We stopped for lunch on a vast open plain with magnificent views in every direction: see the top center and top right pictures below. It’s a wonderful feeling, knowing you’re the only people for at least a kilometer in every direction, in a wilderness as unspoiled as you’re likely to find anywhere in Europe, looking out on snow-capped mountains on one side and an endless lake on the other. The temperature was perfect, the sun had just the right intensity, the ground was dry and soft, and mosquitoes were nowhere to be found. I could have sat there all day to enjoy the simple beauty of it all. Of course, we got up again at some point, refreshed and ready to tackle the second half of the hike. After crossing the open plain, we walked through birch and coniferous forests for the rest of the way, with enough hills and ponds and sudden clearings to keep it from getting repetitive. We got back to the hotel after a total of six hours and fifteen minutes, tired and sore, but nothing that a hot shower couldn’t wash away. We sat outside for the rest of the afternoon, enjoying a cold drink in the sun and watching a group of sparrows go about their playful business. At night, the sunset over Lake Torne was a splendid end to a splendid day. The Abisko River along the Kungsleden. Me during the lunch break. The others right after the lunch break. Excellent weather for a hike. The twin peaks east of Abisko National Park. A sparrow outside the hotel. Our train out of Abisko didn’t leave until late in the afternoon, so we went for another hike today. We took the cable car up from Abisko to Njulla Mountain and hiked the last two kilometers to the top, where we were treated to wide views over Lake Torne and the surrounding mountains. The panorama below shows the lake’s upper 25 kilometers; the remaining 45 stretch off in the distance at the right. The train ride from Abisko to Kiruna was pleasant enough, but not nearly as spectacular as the ride from Narvik to Abisko. Kiruna’s raison d’être is a huge slab of iron ore that has been mined continuously since 1900. In a twist of irony, the city itself is now getting in the way of further mining. However, we didn’t hear that until the next day, so I’m not going into details right now. Instead, I’ll say that our hotel in Kiruna looked pretty normal from the outside, but was rather peculiar on the inside. Every room was a different shape and size, the corridors twisted and turned like a snake on hot sand, and there were many more doors than necessary. It was the kind of place where you expect secret passages to a treasure chamber, a parallel dimension or Russia. I wouldn’t be surprised if Lewis Caroll spent time there while writing Alice in Wonderland. So, about that iron ore… Simply put, there’s a huge slab of iron ore sitting in the ground near Kiruna. Back around 1900, when the Luossavaara-Kiirunavaara mining corporation (LKAB) got to work on mining the ore, it protruded from the surrounding land in the form of a mountain called Kiirunavaara. Studies have since revealed that the ore slab is four kilometers long and a hundred meters thick, and extends down for at least two kilometers. Now here’s the twist: the slab sits at an angle. Consider the schematic on the right. The green bit is the ore slab, viewed edge-on. The top few hundred meters have already been mined, leaving an overhanging wall of rock (black). Kiruna sits somewhere on top of that black part. It’s not in any danger right now of loosing its footing, but if mining operations continue for a few years, Kiruna is going to fall down one building at a time. Because there’s so much iron ore still to be mined, the decision has been made to relocate the entire city. This multi-billion dollar operation will be paid by LKAB. They’ll gladly do so, because the remaining iron ore is worth it many times over. We were told all of this when we visited the mine. If you think this involves rickety elevators, narrow passages and low ceilings, think again. In the Kiruna mine, elevators are only used to haul ore to the surface. Workers and visitors go down by car or bus, following one of many paved tunnels that go several hundred meters below ground. As visitors, we didn’t see any actual ore mining up close. Instead, we had to make do with a tour guide who wouldn’t have been out of place as a drill sergeant in the army. He was an engaging story teller, stressing the scale of LKAB’s operations by inserting words like humongous, colossal and gigantic into every other sentence. On top of that, he knew the ore business inside-out, and was able to explain some fairly difficult processes in simple terms. (Having given several astronomy lectures to a general audience, I know how difficult it is to explain complicated stuff to non-experts.) My only major complaint of the whole visit was that it was too short, so that we had to rush through the final parts before the bus took us back to the surface. A machine for vertical drilling. A machine for horizontal drilling. A machine to haul ore from the mining shafts to the elevators. On the final full day of our trip, we went back to Finland. En route we stopped at a moose farm, because so far only one person in our group had seen a live moose. (Most Scandinavian moose live below the Arctic Circle. Above, reindeer are more common.) My impression of moose after seeing them on this farm: a kind of large, clumsy cows with big antlers. Rovaniemi is the administrative capital and commercial center of Finnish Lapland. It’s famous to some degree for Alvar Aalto, Lordi, the world’s northernmost McDonald’s, and Santa Claus. The latter is called Joulupukki in Finnish, which literally translates as Yule Goat. He lives in Santa Claus Village, or Joulupukin Pajakylä, a few kilometers north of Rovaniemi, right on the Arctic Circle. Visitors can meet Santa in his office for a chat and for pictures. A picture with Santa costs about thirty euros, which explains how he can pay for all those presents at Christmas. Surrounding Santa’s office are chains of souvenir shops, selling the usual array of items that, once back home, you discover you didn’t really want after all. It’s such a revolting display of cheap commercialism, such a shameless tourist trap, that I loved it. Rovaniemi itself didn’t come across as very attractive. It had handsome enough buildings, a central square of the right size, plenty of pubs and restaurants, and parks and rivers, but it had no vibe. It felt dead. Come to think of it, all of the cities on this trip did. Maybe it’s an Arctic thing. Maybe cities just don’t work in the Arctic the way they do further south. All I know is that whenever we entered a city these two weeks, I was always eager to leave again and get back to nature, back to that unspoiled wilderness that still makes up most of the Arctic. I hope it will continue to do so for many generations to come. Santa’s Office in Santa Claus Village, right on the Arctic Circle. And thus came a wonderful holiday to an end. I loved the Arctic, with its bright nights, its unique flora and fauna, its Sami history, its majestic fjords, and its vast forests and lakes. I hope to be back one day—if I do, it may well be in winter, to experience a very different Arctic. For now, Norway, Finland and Sweden, I thank you for your beauty and hospitality. Takk! Kiitos! Tack!